I am a journalism major at North Idaho College, as well as an ardent fan of theater and classical pipe organs. I collect vinyl records of anything except relatively modern music, e.g. pop/rock, modern country and rap. I like almost everything else, including classical, big band, easy listening, old-time country and of course pipe organ music. I am the youngest member of the Spokane First Nazarene chapter of the American Theater Organ Society. Here are a few free organ sheet music pieces which I have come across. Enjoy! #2: Victor Searle: Adeste Omnes Angeli (Medley/Combination of Adeste Fideles and Angels We Have Heard on High) Special cover artwork is here. Victor Searle has other music pieces and arrangements available; email him for more information. Here is a list of his music. Atlantic City Convention Hall Organ Society: Website for the world’s largest pipe organ. 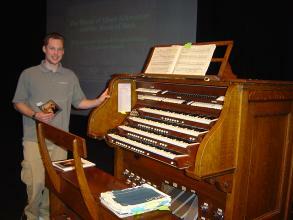 Hot Pipes: Free radio show dedicated to the Theater Pipe Organ. JAV Audio: This is a great source for studio-quality recordings of pipe organs from around the world, featuring such artists as Daniel Roth, Martin Jean and Olivier Latry. Organ Historical Society Catalog: This is a great resource for pipe organ-related books, CDs and sheet music. Pipechat: Email list group dedicated to pipe organs. Pipedreams: Radio show dedicated to the King of Instruments. PIPORG-L: Another, more serious email group dedicated to the Pipe Organ. SaveTheOrgan.org: Website filled with information on both theater and classical pipe organs; includes technical details for blowers, wiring, key action, etc. Theatreorgans-L: An email list dedicated to the Theater Pipe Organ (Link is to an article explaining the difference between Theater and Classical/Church pipe organs). Walnut Hill Theater Organ Page: Run by Richard “Doc” Mogridge, this site has a ton of info, as well as audio samples and links. Wanamaker Organ Website: The world’s largest fully operational pipe organ, in a department store!